Summary: God waited until the end of Creation’s days to make Man as the highest and best expression of His creative genius. Unfortunately, His creatures waited hardly any time at all to rebel against Him in whose image they were made. Since we could not undo the horrible curse upon sin, God made Himself in our image, taking on human flesh in the person of His sinless Son. He righted Adam’s wrong and paid for the sins of our first parents and all their heirs by dying on our behalf. He who is the creating Word of God spoke the recreating words of forgiveness, announcing from the cross, “It is finished.” He who shared our lifeblood gave His life-giving blood to us who were dead in our trespasses. Was formed of earthen clay. Straight into sin, death, hell. Avowed He’d meet their need. 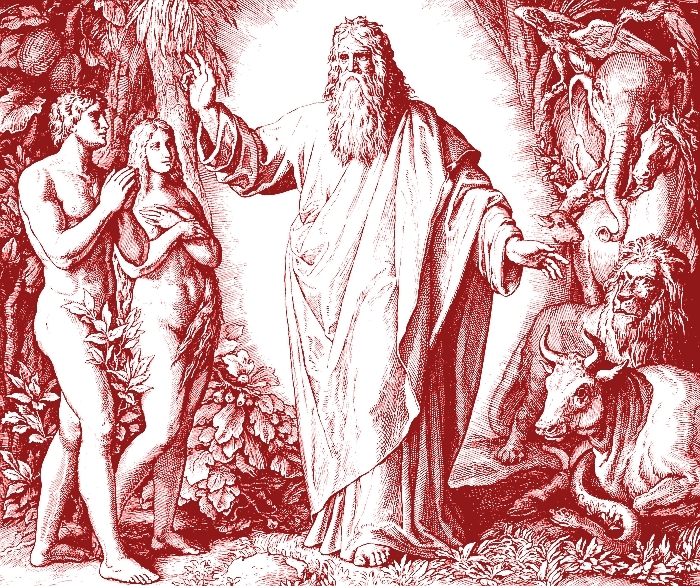 Text: And God said, “Let the earth bring forth living creatures according to their kinds — livestock and creeping things and beasts of the earth according to their kinds.” And it was so. And God made the beasts of the earth according to their kinds and the livestock according to their kinds, and everything that creeps on the ground according to its kind. And God saw that it was good. Audio: Click to hear the MP3 of In the (New) Beginning: The Image of God. Illustration: The Sixth Day of Creation from Die Bibel in Bildern by Julius Schnorr von Carolsfeld at Wikimedia Commons.